What are the Rules on Supermarket Deals with Suppliers? UK - A new e-book has been launched to help suppliers to the UK's major supermarkets fully understand the Groceries Supply Code of Practice (GSCOP), allowing them to be more aware of their rights and breaches of the code by supermarkets. The GSCOP was introduced by the UK Government to encourage major UK supermarkets to treat suppliers fairly. Acting like a set of rules, the GSCOP aims to help the supplier-supermarket relationship. Over the last year, Christine Tacon was appointed the Groceries Code Adjudicator to enforce the code and was given the power to fine supermarkets up to one per cent of their turnover for a breach of the code. Although by law all supermarket buyers must be trained in GSCOP, the 2015 Groceries Code Adjudicator Annual Survey found that a worrying 76 per cent of suppliers do not fully understand the GSCOP. The concern Ms Tacon has is that the code was introduced to help suppliers, yet most do not know what it means. The impact is that even if a supermarket does breach the code, the supplier will not know anyway. Some of the key points in the code can really help suppliers. For example, suppliers should no longer be the predominant funders of promotions, suppliers can claim compensation back from the supermarket for poor forecasting and suppliers no longer need to buy third party goods from appointed suppliers. The devil is in the detail of the code and whilst the code has some awareness in the supplier community, the code is a part of the ‘Order’, and that is even less understood. Not understanding the rules is okay, like the offside rule, but if you are a footballer, this is going to cause problems, said MBM, trainers to the UK Grocery Industry. This is similar for Account Managers, Category Managers and Sales Directors. They play in this world of supermarkets and they need to understand the rules because otherwise they will be left behind, or even worse, continue to pay for items that, by law, should no longer be funded by the supplier. 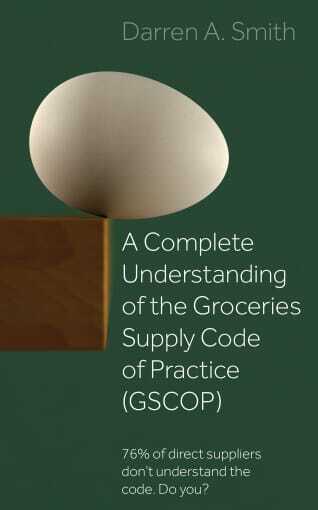 To fully understand the rules, you can get hold of your copy of the GSCOP book ‘A complete Understanding of the Groceries Supply Code of Practice (GSCOP)’, here.